Polka Dot Overload | Sewing, knitting & vintage projects, tips, tutorials and cartoons! : Sweater Girl Showdown 2014: Which Two-Tone Shrunken Cardigan to Knit Now? 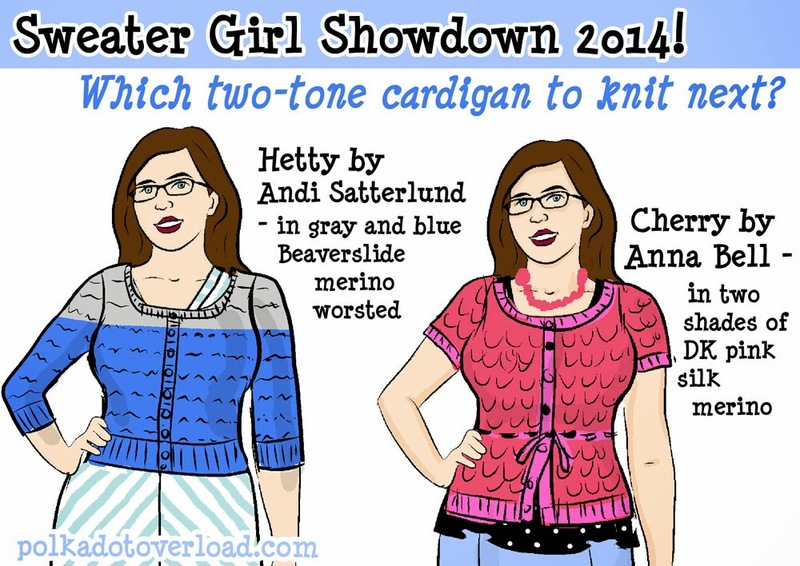 Sweater Girl Showdown 2014: Which Two-Tone Shrunken Cardigan to Knit Now? 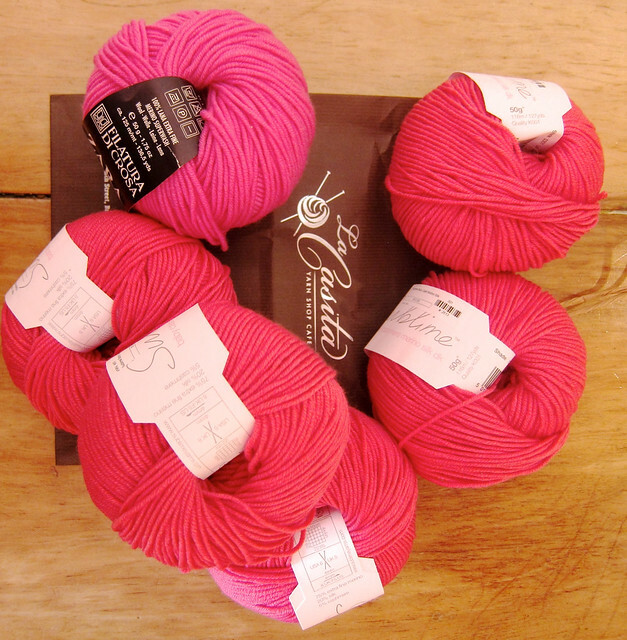 Yes, yes, I am a slow and indecisive knitter (but I have a history of carpal tunnel! So I HAVE to knit glacially, for my hands' sake). I DID finish three cardigans last year... but two of them were for babies. So as I am putting the finishing touches on the button bands of the Delancey cardigan I decided on in last year's Sweater Girl Showdown 2013 (and as I sit here wearing the Georgina cardigan I made for 2012's Sweater Girl Showdown) I of course jump ahead to the excitement of the next negative-eased cardigan to come. 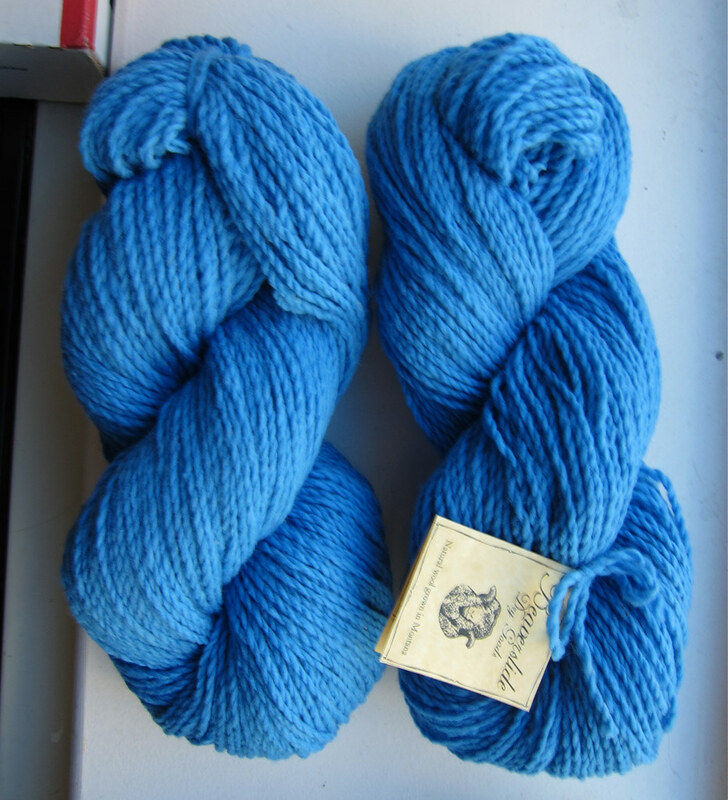 This time I am just deciding between two, both of which I have the yarn already in stash. I don't have enough solid card yarn to finish either, hence the two-tone theme. Cons: A bit too warm for summer wear, even in the air-conditioning, I think. 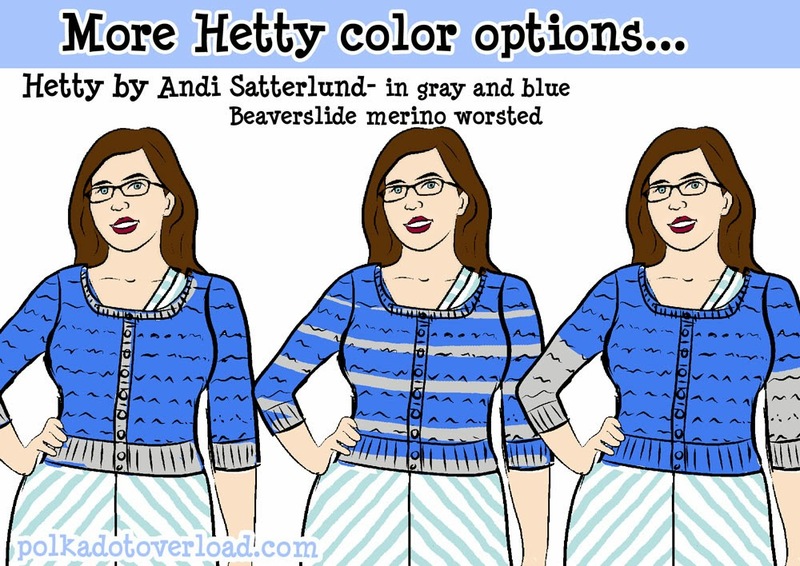 I'm also not 100% sold on my two-tone sketch for this—I'd kind of like the blue closer to my face, so maybe I'd use the gray for the bands and lower part of the cardigan—not sure. The pattern: Cherry by Anna Bell: Also lovely, lacey and fitted, and a bit more suited for spring/summer with its lighter-weight yarn and short sleeves. The yarn: 1 ball Filatura di Crosa Zara superwash merino and 5 balls Sublime baby cashmere/merino/silk blend (bought with a gift certificate from the husband at my beloved local Brooklyn yarn store La Casita last year—they didn't have quite enough of it in just one color). So soft, so pretty, so summery! Pros: I've been wanting to knit this for over a year (it was the runner-up last time) and I have the yarn ready and waiting. Plus: so perfect for a summer knit! 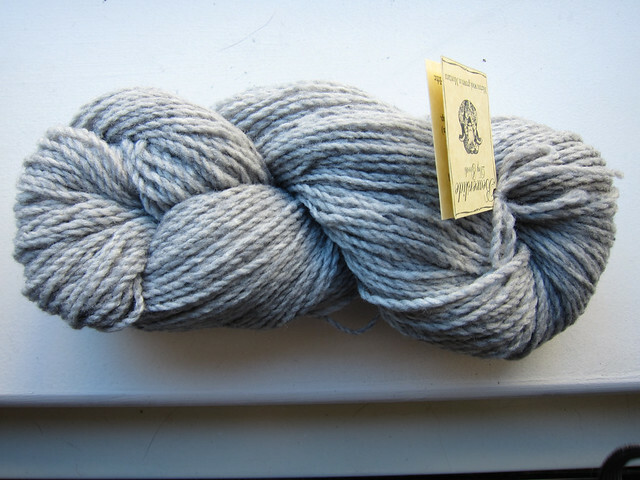 And there are a lot of really lovely versions of this on Ravelry to envy. Cons: The website for the Cherry pattern is gone and it can no longer be purchased ad hoc. But my library has the book it appeared in originally, Modern Knits, Vintage Style. I'm still making up my mind here... but which would you knit if you were me? I vote for the Cherry by Anna Bell since you have the yarn on hand, can get the pattern for free, and can wear it for spring/summer. It is a strong option!!! From your sketch I immediately thought the Cherry was the more appealing choice. One thing that might be influencing me is that I don't like a horizontal yoke above my (less full than yours, but still somewhat full) bust. Major sympathy on the carpal tunnel: it has ended my knitting career. I used to be very prolific. This winter I tried to make a simple garter stitch shawlette, and it ended in numbness and tingling before I had even made four inches. Yeah, I have to admit the horizontal yoke isn't calling to me. Carpal tunnel is the WORST and I'm so sorry you can't knit! I got a lot of help and therapy (the Alexander technique helped me especially) and after a total break for four months I can knit comfortably now but I don't do more than a few rows at a time so I'm very slow... being very cautious! It seems like you're more inclined to do the Cherry but I think the Hetty will flatter you more, it's simpler and (given your pace of knitting) would be done, at the perfect time, when the weather is cooler, yes? I also think your colour blocking idea is lovely on the Hetty, though I understand your desire to have the jewel colour closer to your face. I still think you can manage that one with your yardage in a way that will appeal to you, if you opt not to do the method you've sketched above. I actually am leaning Hetty, I just bought it two days ago before I realized I couldn't use the pink yarn because the wrong weight. I do think I'm going to draw out some other color-blocking ideas, though! How about a hybrid of both? I like Hetty so maybe a shortsleeve one in blue with grey trim instead of yoke. Yah, now you've swayed me... gradient stripes!!! I knew you wouldn't be able to resist!!!! The striped Hetty is calling to me! i made the hetty and it's a lovely pattern and a fast knit. i find that thciker wool and chunkier needles don't aggravate my carpal tunnel as much as finer wool and tiny needles. i suffer from it too but didn't have many problems while knitting hetty. it comes together quickly too. 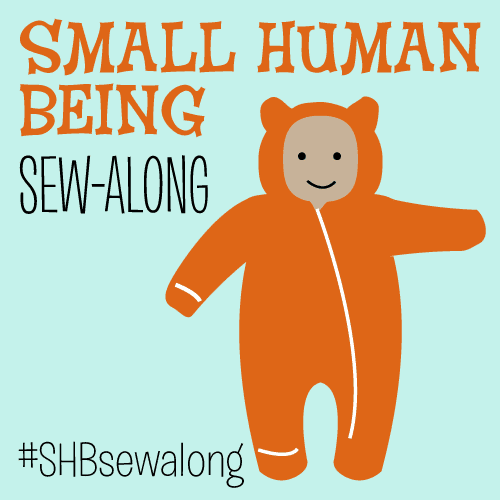 I agree, for some reason the tiny needles and yarn seem to be worse. Thanks for the tip! I vote for Hetty! I love the version with the ribbing/button band in gray and everything else in blue, although stripes is a close runner-up for me! Stripes are tempting, I know! Can I just say, I love your drawings so much! Whatever you write (not that it isn't interesting) I'd always return to your blog for the visual appeal (that goes for your clothes as well). On to the point :-) : I think pink/coral/rose tones look lovely on you. After the purple sweater from the last showdown (love that) I'd love to see a brighter color on you. The patterns are both gorgeous, I agree that you should choose whatever pattern goes best with your knitting style and limitations. What exactly does "shrunken" mean in this context? I've seen this term bandied about regarding fit, but does it mean the hem is high? Sleeves are short? Less ease? I love Beaverslide yarn. Nice stuff, that. When in doubt, I almost always go for pink, but that blue and grey yarn looks so delightfully squishy that I think I must advise you to knit it next.